Although green chypres are a dying breed, we’re lucky enough to have some good ones on the market, including L de Lubin, Givenchy III, Chanel Cristalle and Vero Profumo Mito. What, if anything, does Bruno Fazzolari Seyrig add to the line-up? The website doesn’t classify Seyrig as a green chypre, but to me it’s kissing cousins with the perfumes I mentioned above. Seyrig goes on with a razor-sharp blast of tart green and citrus, super-charged with aldehydes. The fragrance’s edge does soften slightly, and I like it best after about an hour of wear, when Seyrig could be the gin and tonic of the perfume world — refreshing and slightly bitter, served with a wedge of cucumber, not lime. What does stand out — and what sets Seyrig apart from other green chypres — is the breath of incense that infuses it. I wouldn’t call Seyrig an incense perfume, but once I noticed it, the fragrance’s “color” turned from new-grass green to woody amber in my mind. (The perfume’s real color is a yellowish-green, by the way.) Once the rest of the fragrance has burned off, the incense persists. Even after a bath, I smelled quiet frankincense on my forearm. For comparison, Givenchy III is rosier and woodier; Choc de Cardin is cleaner; Carven Ma Griffe shows more white flowers (and vanishes instantly, dang it); Yves Saint Laurent Y has more ylang ylang; and L de Lubin is warmer and spicier on the dry down than Seyrig. 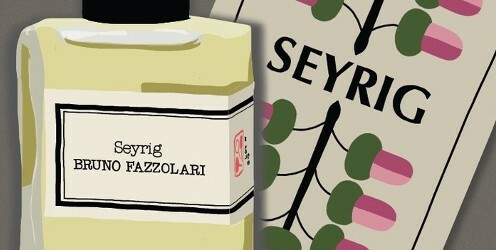 If you already have a go-to green chypre, you may not need to rush out and try Seyrig. But, if this is a new category for you, or if the idea of incense intrigues you, or if you haven’t quite found the right one yet, do give Seyrig a try. As for wearing any green chypre, be sure to bring your attitude. Bruno Fazzolari Seyrig is $110 for 30 ml Eau de Parfum. For information on where to buy it, see Bruno Fazzolari under Perfume Houses. I haven’t smelled that one in too long! This sounds like something I would like to try. It sounds like there is a nice balance in the green/ incense contrast. Thanks for the review. I found them well balanced, definitely. I’d love to know what you think of it, if you get the chance to sample it. I have it and like it a lot, along with Au Dela. I own Au Dela by Fazzolari which I have seen classified as a modern chypre. Although it seems more of a balmy green than a chypre scent IMO. Almost an HG scent for me except that it has a strong cumin note. I’m curious if Seyrig has that lovely mossy note. I don’t know if you’ve tried Au Dela? If so, are there any similarities? I haven’t heard much buzz about Seyrig since it first came out. Great review! No, I haven’t tried Au Dela, but your description is intriguing! I smell a little mineral-y moss in Seyrig, but not a ton. And I’m glad you liked the review! I really enjoyed Au Dela, but had trouble relating to Seyrig. Au Dela has a round warmth that made it accessible for me. And I’d happily wear Givenchy III, Chanel Cristalle and Vero Profumo Mito. Seyrig definitely has an edge, and I think the incense contributes to it. I bought a split of this – only 5ml, and I’m glad it wasn’t more. They sucked me in with all the description of a rich aldehydic floral, but I was disappointed that it did not actually seem very floral on me. Lots of woods, and yes, some incense. Very resiny, which is not my thing at all. I kept wondering what was wrong with me, but I think perhaps my “floral tolerance” is so high that I was surprised not to get more of a floral focus. Sounds like it didn’t seem particularly floral to you, either? I didn’t get a lot of its floral aspects, either, so you’re not alone! It felt much more green to me than traditionally floral. Not to me at least. Well, I was disappointed by it. Anybody want my split portion? Wow, this is so interesting. I just reviewed Seyrig myself: I NEVER got anything past aldehydes. Aldehydes for days… and nights…. and days! No incense, no floral, no nuttin! Ah well. Win some lose some. Skin is crazy! Maybe I’m good at magically metabolizing aldehydes.